High School Math based on the topics required for the Regents Exam conducted by NYSED. The following are the worked solutions for the Algebra 1 (Common Core) Regents High School Examination June 2016. Regents High School Algebra I June 2016 Exam (pdf). 2. An expression of the fifth degree is written with a leading coefficient of seven and a constant of six. Which expression is correctly written for these conditions? 3. The table below shows the year and the number of households in a building that had high-speed broadband internet access. For which interval of time was the average rate of change the smallest? 4. 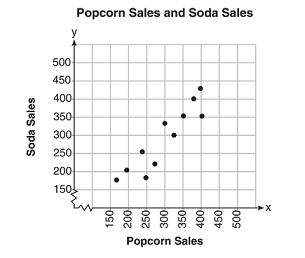 The scatterplot below compares the number of bags of popcorn and the number of sodas sold at each performance of the circus over one week. Which conclusion can be drawn from the scatterplot? 5. The Celluloid Cinema sold 150 tickets to a movie. Some of these were child tickets and the rest were adult tickets. A child ticket cost $7.75 and an adult ticket cost $10.25. If the cinema sold $1470 worth of tickets, which system of equations could be used to determine how many adult tickets, a, and how many child tickets, c, were sold? 6. The tables below show the values of four different functions for given values of x. 7. The acidity in a swimming pool is considered normal if the average of three pH readings, p, is defined such that 7.0 < p < 7.8. If the first two readings are 7.2 and 7.6, which value for the third reading will result in an overall rating of normal? 14. The growth of a certain organism can be modeled by C(t) = 10(1.029)24t, where C(t) is the total number of cells after t hours. Which function is approximately equivalent to C(t)? 15. A public opinion poll was taken to explore the relationship between computations. age and support for a candidate in an election. The results of the poll are summarized in the table below. What percent of the 21– 40 age group was for the candidate? 16. Which equation and ordered pair represent the correct vertex form and vertex for j(x) = x2 - 12x + 7? 17. A student invests $500 for 3 years in a savings account that earns 4% interest per year. No further deposits or withdrawals are made during this time. Which statement does not yield the correct balance in the account at the end of 3 years? 18. The line represented by the equation 4y + 2x = 33.6 shares a solution point with the line represented by the table below. 19. What is the solution of the equation 2(x + 2)2 - 4 = 28? 20. The dot plot shown below represents the number of pets owned by students in a class. 21. What is the largest integer, x, for which the value of f(x) = 5x4 + 30x2 + 9 will be greater than the value of g(x) = 3x? 22. The graphs of the functions f(x) = |x - 3| + 1 and g(x) = 2x + 1 are drawn. Which statement about these functions is true? 24. Sara was asked to solve this word problem: “The product of two consecutive integers is 156. What are the integers?” What type of equation should she create to solve this problem? 25. Given that f(x) = 2x + 1, find g(x) if g(x) = 2[f(x)]2 - 1. 26. Determine if the product of 3√2 and 8√18 is rational or irrational. Explain your answer. 27. On the set of axes below, draw the graph of y = x2 - 4x - 1. State the equation of the axis of symmetry. 28. Amy solved the equation 2x2 + 5x - 42 = 0. She stated that the solutions to the equation were 7/2 and -6. Do you agree with Amy’s solutions? Explain why or why not. 29. Sue and Kathy were doing their algebra homework. They were asked to write the equation of the line that passes through the points (3,4) and (6,1). Sue wrote y - 4 = -1/3(x + 3) and Kathy wrote y = -1/3x + 3. Justify why both students are correct. 30. During a recent snowstorm in Red Hook, NY, Jaime noted that there were 4 inches of snow on the ground at 3:00 p.m., and there were 6 inches of snow on the ground at 7:00 p.m. If she were to graph these data, what does the slope of the line connecting these two points represent in the context of this problem? 31. The formula for the sum of the degree measures of the interior angles of a polygon is S = 180(n - 2). Solve for n, the number of sides of the polygon, in terms of S.
32. In the diagram below, f(x) = x3 + 2x2 is graphed. Also graphed is g(x), the result of a translation of f(x). 33. The height, H, in feet, of an object dropped from the top of a building after t seconds is given by H(t) = 16t2 + 144. How many feet did the object fall between one and two seconds after it was dropped? Determine, algebraically, how many seconds it will take for the object to reach the ground. 35. An airplane leaves New York City and heads toward Los Angeles. As it climbs, the plane gradually increases its speed until it reaches cruising altitude, at which time it maintains a constant speed for several hours as long as it stays at cruising altitude. After flying for 32 minutes, the plane reaches cruising altitude and has flown 192 miles. After flying for a total of 92 minutes, the plane has flown a total of 762 miles. Determine the speed of the plane, at cruising altitude, in miles per minute. Write an equation to represent the number of miles the plane has flown, y, during x minutes at cruising altitude, only. Assuming that the plane maintains its speed at cruising altitude, determine the total number of miles the plane has flown 2 hours into the flight. 36 On the set of axes below, graph. How many values of x satisfy the equation f(x) g(x)? Explain your answer, using evidence from your graphs. 37. Franco and Caryl went to a bakery to buy desserts. Franco bought 3 packages of cupcakes and 2 packages of brownies for $19. Caryl bought 2 packages of cupcakes and 4 packages of brownies for $24. Let x equal the price of one package of cupcakes and y equal the price of one package of brownies. Write a system of equations that describes the given situation.